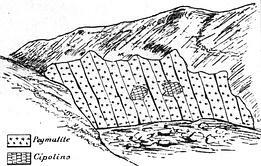 · Tourmaline crystallographic properties: Trigonal. · Chemical Properties: Alumina borosilicate with fluorine. pegmatites, limestones and schists, placers. Coloured tourmalines are related to sodolithic pegmatites. same the rhomboedron combined with that (0111) = P.
Crystal of the hexagonal type finished Polychrome tourmaline being in Tsilaizina, Madagascar. at a peak frequently found in Tsilaisina. Tourmaline crystal containing multicolored geometric patterns weighting 7.5 kilos. The crystals of this remarkable mineral are very variable in size, small one are homogeneous only and of a beautiful pigeon blood red color lighter or darker. Those larger almost always have a complex structure and are formed by concentric zones. At the time of the deposit discovery, very large crystals were quite exceptional and were still inhomogeneous. In some rubellites, alternating zones are all colored in red, more or less vivid, the center is such an intense purplish red, middle and peripheral zones are red or pink in various shades and even colorless. In other stones the center is composed of yellow or brown, and the periphery composed by rubellite. The reverse also occurs on large crystals that appear black while the central parts show of a beautiful red. When color zoning are numerous they are very thin. The optical properties of tourmaline from Antsomgombato examined on blood-red pieces, lighter red and zoned crystals show that they are all slightly biaxial. In Tsilaisina, zoned crystals are also very common. Some crystals show some zones of alternating color and which are not concentric, but arranged in parallel layers over the height of the prism. Here pink tourmaline is distinguished from others by its low content of manganese and a high proportion of lime. The main fact that emerges from the observation of tourmalines from the above occurrences, is their undeniable relationship. 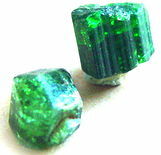 All tourmalines contain manganese in varying proportions, and sometimes substantial, all are of a remarkable poverty in magnesia and iron oxide with the exception of black tourmaline. The silica and alumina will undergo changes that reach only 2%, and the total amount of alkali is between 1.04 and 3.48%. Fluoride, always constant, oscillating between 1.4 and 0.73% boric acid and between 9.46 and 11.03%. 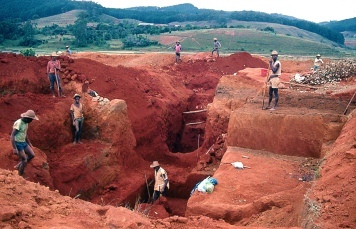 The most alcaliferous tourmaline is the red of Antsongombato, 3.48%. The alkalies do not seem to have a direct influence on the coloration. Here, manganese is probably the main chromogenous factor, but the color also depends on the elements that accompany it. The combined presence of lime appears to be the cause of the pink or red. 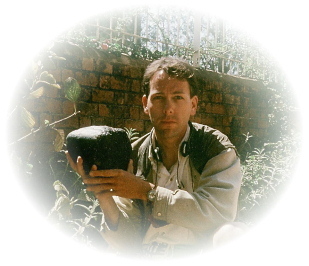 measured about fifteen meters, the coal face was to Madagascar). occurrence was famous for its red-ruby tourmalines. Text written by Alain Darbellay.